We meet every Sunday in The Brian Jackson House, New North Parade, Huddersfield, HD1 5JP. We meet in the ‘engaging space’ in the basement room. Walk past the reception, and either go down the stairs on the right or simply get in the lift and use the ‘B’ button. There are toilet facilities in the same room, everything is accessible for wheelchairs and pushchairs. The centre does not have its own car parking facilities but there is pay and display car park on New North Road, just outside the building. Parking is free up until 12pm on a Sunday, after that there is a small charge (normally no more than £1). 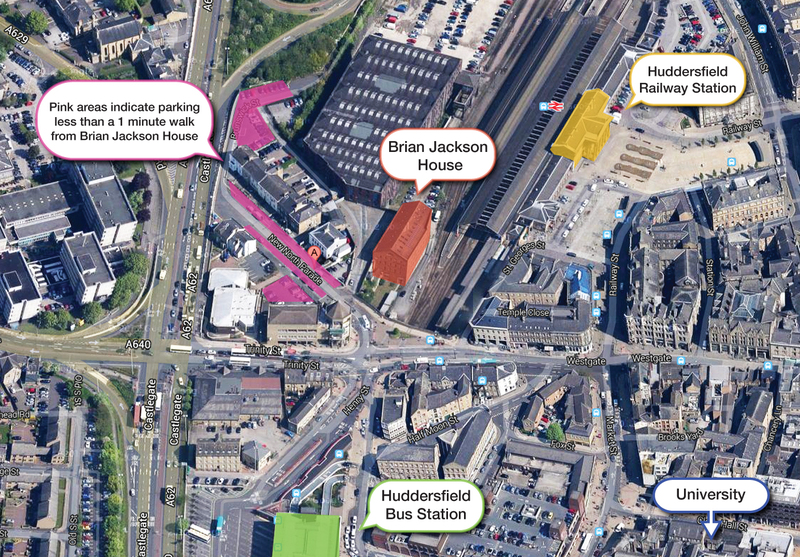 Parking spaces are highlighted in pink on the large map at the bottom if this page. The centre is fully wheelchair accessible and has a lift to all floors.